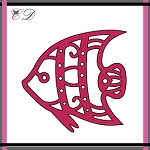 Gloria here today, I want to share with you a card using Angel fish die from Cheapo dies. For create this card, First I die cut the angel fishes with watercolor paper five times, then adhere them onto watercolor paper panel using glue pen. I colored the angel fishes and the watercolor panel using Peerless watercolors with paint brushes. Once the panel completely dry, I mounted it on white card base using double-sided tape. For the sentiment, I used scollop stitch square die set by Unbranded cutting dies. that's really cute. I see another die in my future! Totally creative card Gloria, I absolutely LOVE how you have created with it and the colors are ,well, 'yummy'! !